InVogueJewelry: "18k White Gold Filled" Rings? "18k White Gold Filled" Rings? I'm not here to "call out" any fraudulent sellers. I'm only writing my blog to give information to anyone who might be searching for info on a gemstone or how to care for jewelry...things like that. However, every now and then, I'll see something on Etsy that is TERRIBLE, and since these sellers are deceiving a LOT of buyers (and reporting to Etsy does absolutely nothing), I want to possibly help future buyers with information. Knowledge is power! I've talked about the glass stone called Opalite being sold as "moonstone" or "opal"; Moissanite being sold as a "natural" stone instead of a lab-created stone, just like cubic zirconia is a diamond simulant; hydro quartz stones being sold as gemstones and not glass; and CZs being sold as "created diamonds" rather than simulated diamonds. There are also incredible claims that gold filled is "100 times more gold" than plated, or "100% more gold" which will "never tarnish" which is NOT TRUE (and I've written about this in another post). All of those are examples of fraud, or "creative marketing", and I hope I've helped some people at least look further into the jewelry they are buying. There is a UK seller on Etsy who has sold thousands of rings and things. He claims his CZ rings are "created diamonds" set in plated mystery metals. He claims his rings are "18k White Gold Filled" with a variety of "gemstones" set in them. And not just this one UK seller---a simple Etsy search for "white gold filled ring" will show many sellers who offer gold PLATED rings, or even Sterling Silver rings, as "white gold filled". (2) You can have gold filled wire or gold filled sheet (very thin) but you cannot cast a ring with "gold filled" metal. Why? Because gold filled wire, tubes and sheet is made by adhering a VERY thin layer of karat gold (like 10 or 14k) onto brass. So, it's a brass core with a thin layer of 10k or 14k gold that has been rolled onto it, and by heat and pressure, the gold becomes basically permanent. It's a VERY thin karat-gold layer on top of brass. You cannot melt this material and pour it into a mold! You CAN however use wire to make a ring! There are lots of very tiny stacking rings made with 14k gold filled WIRE. But that is not what this particular UK seller is offering. He has traditionally styled rings with prong settings (which are cast) and is selling these as "engagement rings." The option for these rings is either "Titanium" or this "18k Gold Filled" metal. And by "18k White Gold Filled" I think he means "gold plated brass"----costume jewelry---because that is what it is. WORSE, the stones are not genuine gemstones. They are CRYSTALS. Sometimes they might be CZ, but none are gemstones. 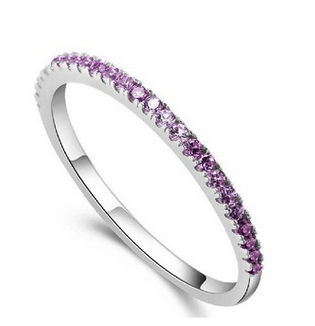 One big giveaway that an eternity ring is made with crystals is that the inside of the band is solid. Gemstones are always set with little openings in the back, to allow light to come through. Pink CZ being sold as sapphire. 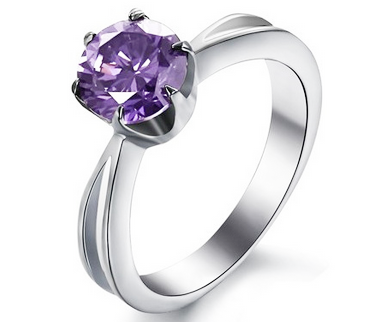 Purple CZ sold as amethysts or tanzanite. Kelly green CZ sold as emeralds! It's really bad. This also is offered with a CZ but sold as "white topaz". It's so sad to see glowing comments on his feedback, such as "my fiance loves this tanzanite ring" when I know it's just a CZ ring that is worth nowhere near the $100 he paid for the ring. Is it pretty? YES, but is it as advertised? NO. Is it worth $100? Absolutely NOT. Anyone can sell whatever they want and make a profit. That's how businesses operate! But selling something as a gemstone when it's just a simulated stone, set in plated brass but claiming it's "gold filled", in order to make a huge profit, is just wrong!